Okay, I got the poop (and it's small and pellet-shaped, like a hamster's but bigger). Behold Mickey Mouse...oops, I mean Punxsutawney Phil: the official groundhog of Gobbler's Knob, Pennsylvania, and a really lame reason to buy a Hallmark card (people do). He/She did in fact see his/her shadow, and I was right the first time: like it or not my fellow Farmer's Almanac devotees, that means Spring will not come early this year (unless Phil is wrong, like he/she is 60% of the time). So batten down the hatches and stoke the fireplace, fill up the sandbags, buy another shovel, brace for rain at the coast and snow in the mountains (PST). Rest assured, however, that unless the Marin Headlands is being hammered by a deluge of biblical proportions, I will be hiking through it all (well, a lot of it). You see I like getting out there when the potent skies keep people inside or on Mondays when most of them are working. I like it even more when Mother Nature is slightly agitated, even throwing a hissy-fit; when the elements jostle my being, even slap me in the face and let me know I'm alive. Stupid, maybe, but electrifying nonetheless. Speaking of stupid: we'll get to a story of a misguided hike in the hills above Stinson Beach in 2006. A handful of friends and I hiked The Loop (aka Hill 88, map shortly) on Sunday, January 31 in clement weather, and I am happy to report that the first wildflowers of the year are just poking their heads skyward. We came upon a few tentative white Milk Maids, spiky-leaved Footsteps of Spring and succulent, infant Chick and Hens. The tramp was lovely, as usual, but it seems The Little iPhone That Could is not gonna be the preferred way to capture images of the native flora. Based on my initial attempts the sunlit colors are too intense, too hot, and the details are lost. So when the weather is better and the bloom more significant I'm gonna break out the old Canon EOS Rebel and see if that'll do the trick. Until then, and after some pics of Sunday's outing, here's that story from April 15, 2006: California's last El Niño year. 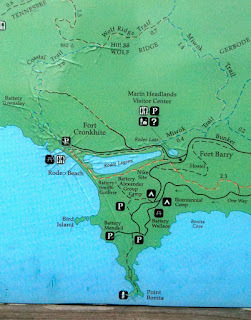 A partial map of the Marin Headlands, with The Hill 88 Hike in the top half section. 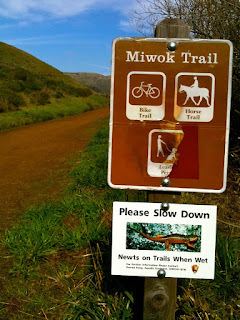 The Loop, as we also fondly call it, starts at Rodeo Beach and heads up, up, up the Coastal Trail to the junction with Wolf Ridge Trail, then connects with Miwok Trail back down to lagoon level, where it's a straight shot back to the beach. I can't say how many times I've hiked The Loop; but I can say that each and every time I have there's been a moment when I thought or even exclaimed out loud: "Oh my god, look at that!" It always gets the heart pumping, it always presents some new and beautiful peek into the beauty of the natural world, and it's always good, inexpensive therapy. 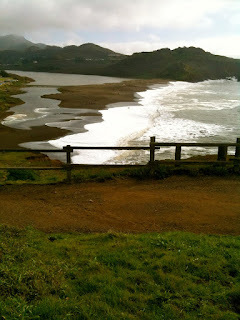 Rodeo Beach and the lagoon, from the start of the climb. During the summer months the two are wholly separate, but El Niño rains and full moon high tides have broken the barrier between salt water and fresh. The view from further up the Coastal Trail. 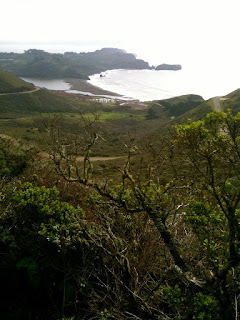 From Wolf Ridge, looking down into Tennessee Valley: another great spot in the Golden Gate National Recreation Area, with trails leading to Tennessee Cove, Pirate's Cove and Muir Beach. Hiking buddies Julie, Calvin and Heidi on the trail, with the mighty Pacific in the background. Coming down the Miwok Trail, with a view of Gerbode Valley. Before Congressman Philip Burton and other like-minded people led the charge in early '70's, this was all slated for a housing development called Marincello. Thanks be to Allah! Some damn good advice, in every aspect of life. Greetings my fellow outdoor enthusiasts. Ahhh…Springtime in northern California! Five straight weeks of rain continues unabated, native wildflowers carpet the soggy land, ski season in the Sierra looks set to last until July, and my legs are covered in poison oak. Dammit all! I sensed that hillside trek was gonna be trouble. It was wet, muddy, slick, narrow, overgrown, un-trampled because of the persistent rains and vague going from the very start. Sure enough, forty-five minutes in we lost the trail, yet Dustin, Keith and I proceeded anyway. The spectacular view down the mountain to Stinson Beach and the ocean, and the fact that we had never hiked that particular area before, kept us going. Huffing and puffing up the steep, waterlogged western flank of the continent - hoping, searching for a way through to the top, to even lovelier vistas, to more adventure, wanting desperately to complete the unfamiliar loop back to the car during the break between storms - we forged on. Alas, to no avail. 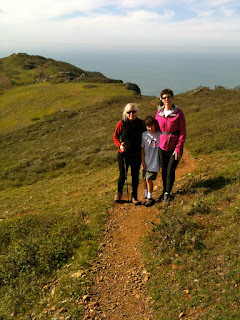 After an hour in vain, we retreated back down to sea level, drove over to Muir Beach and then returned to the city. The poison oak plants were obviously still dormant, unrecognizable in the tangle of chaparral. I didn't see any telltale shiny red and green leaves, but I know that the Headlands, Tennessee Valley and Mount Tamalpais are ground zero for the devil; that even in winter and early spring, with no apparent foliage, it can still wreak havoc. As my bare legs (mistake number two) scraped against the mix of indigenous scrub that crowded in on what we thought was the path I figured I was probably tempting fate. Stupid, stupid, stupid. I reached inside my pack and donned the rain pants I had brought along just in case the weather deteriorated. Too late. Six days later, with the hike a pleasant yet frustrating memory, I found what I thought was an irksome little fleabite down by the rim of my sock. Odd, I mused; where on earth could I have gotten that? The next day I put two and two together as reality dawned and the rash reared its ugly head, flaring up in multiple spots: shin, ankle, thigh, knee, calf, other calf, other knee. Now, closing in on two weeks since we trampled the coastal flora, the battle on my legs is just hitting its stride, and the inflamed colonies of tiny red blisters are still happily oozing and weeping their noxious brew. The accompanying itch is nothing short of astounding. Small shivers of endorphins erupt and course through my body as my pant legs gently brush against the infected areas; the hair on my legs tingles with an alarming yin and yang, pain and pleasure, sensation. With the stimulation my mind briefly numbs, consumed by a macabre juxtaposition of “oh yeah, that’s good” and “ouch, that really hurts”. Even worse, under the cover of darkness the isolated, blotchy sores slowly warm up as I sleep and soon begin pulsing with a life of their own, searing my skin as the unmerciful legacy of the toxin urushiol swells toward climax. At four in the morning I am wrenched awake with a heat so intense it beckons me toward insanity. Vaulting blindly out of bed, my brain careening wildly for a way out of the torment, I am confident that if I cave in and start clawing madly away at the inflammation (out, out, damn spot!) I will be rewarded not only with an even worse infection, but also with the most pleasing, complete, sublime…orgasmic, even, shudder of unfathomable relief. Yet I resist scratching with all my might and smear on the IvaRest which, thank (insert your god), provides a cooling respite from the turmoil and dims any temporary thoughts of leaping out the living room window. Besides, it's a mere fifteen-foot drop to the pavement, which would no doubt only leave me with a broken leg covered in poison oak.